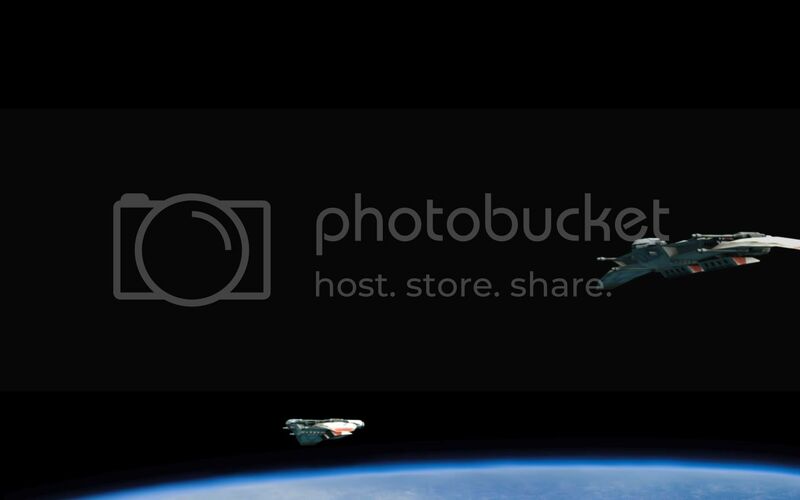 A pair of Mk X's over Caprica. 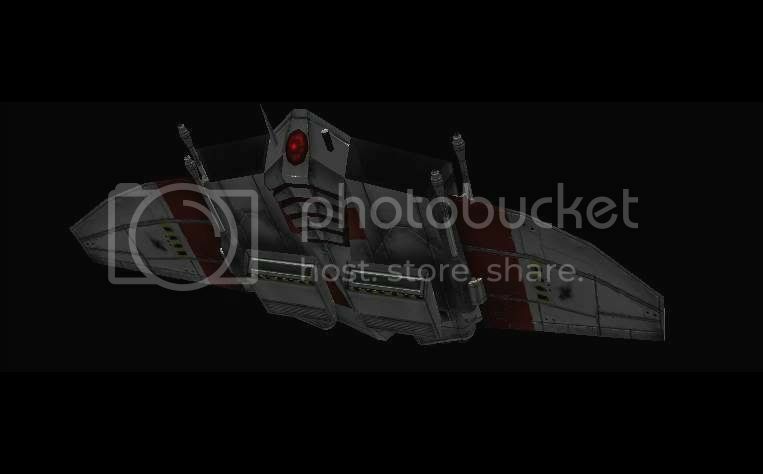 Sporting four gun mounts backed by two missile launchers, this bad boy wears its feelings on the outside. Neutralizing a mark ten is part of a pilots training and if you can't get past one of these then you may need to step aside and let a better pilot through. The good news, we supply a viper - fully armed, you supply the attitude. The Mk IX drone first made an appearance during the BTRL period and was intended to cover a training gap for new pilots. The concept was initially inspired by DeSanto's version of the original raider. 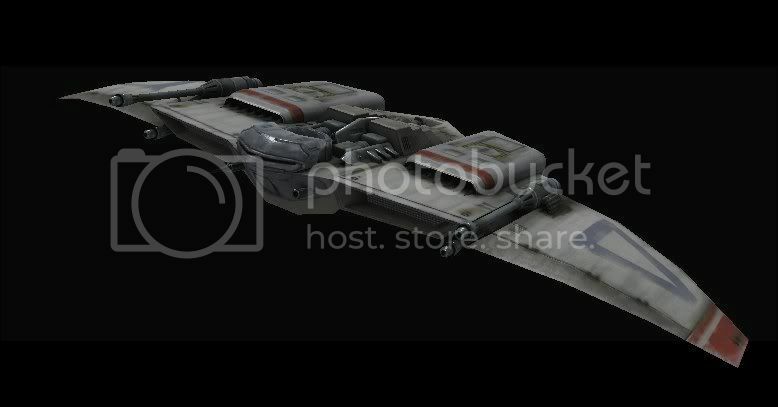 Modeling was taken care of by Meleardil with Starslayer providing additional concepts as needed. Texturing was covered by Turambar. During the modeling process some interesting designs can evolve. Unfortunately they can also end up rejected for various reasons. Even at this earlier stage the intakes, wings and guns are virtually identical to both the Mk IX and X versions. A needed change to the front required further concept development. The Mk X as you would expect is a redevelopment of the Mk IX. A fair bit of the model is still Meleardil's work though, as most of the major structure was retained. Internal partitions were removed and the top central portion was redesigned to provide a more aggressive appearance. 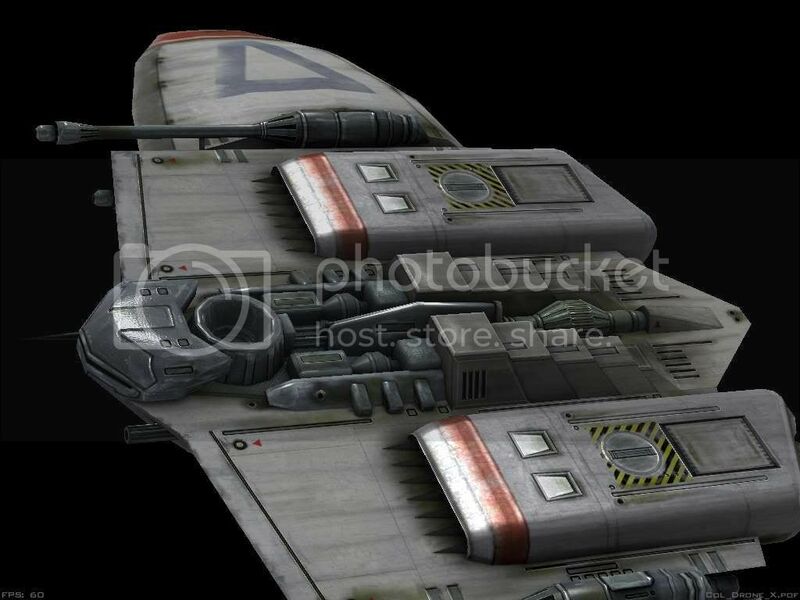 This image shows some of the thrusters that populate many of the fighter class. Although I've moved many of them around on this model, FUBAR-BDHR managed the time consuming task of positioning and tabling each thruster on all the fighters - some people get all the fun jobs. The final word I'll leave courtesy of Ace's shiny new tech description. The Cylotron Mark X is an improvement upon earlier drone models with an enhanced slaved quasi-AI control system and thicker armor. Equipped with a multitude of sensors to judge pilot accuracy, ammo conservation, and flying capabilities, the Cylotron allows instructors to accurately gauge each pilot's capabilities. Frighteningly effective in live-fire exercises, the Cylotron Mk X is the closest thing to a Raider that Viper pilots have faced in the past thirty years. For some anti-AI activists demanding an end to the Cylotron program, the Mk X is too close to the real thing. Wow, I was wondering if you guys would do the steering thrusters. Kudos to FUBAR for putting them all on, must have been a hell of a dull job. Doing thrusters on one isn't too bad, doing all the rest.. a wee bit of patience required. Great job. But isnt that the exact same one that was used in BTRL? It looks suspiciously familiar. Sorry my mistake. I didnt read the bio about how it is based on the btrl model. 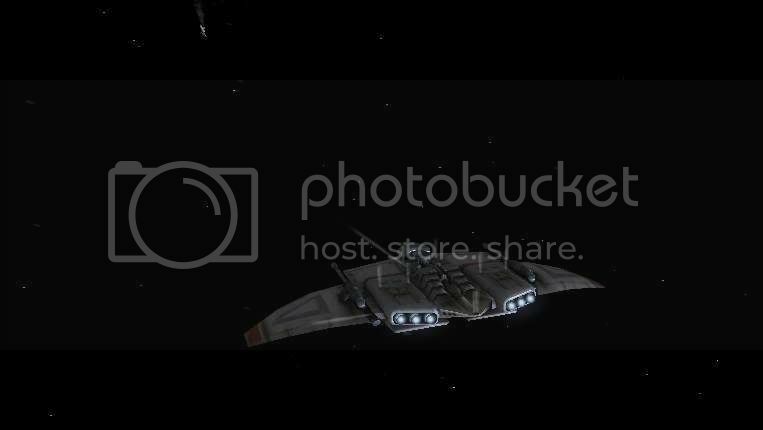 Also will that slot have a Cylon red eye or will it remain looking empty? I'm curious as to the in-game justification behind the hybridized head of a new raider, body of an old one, particularly if this is following on from the near-zero-contact between the sides of the most recent series. A real in game explanation could be that its just coincidence. 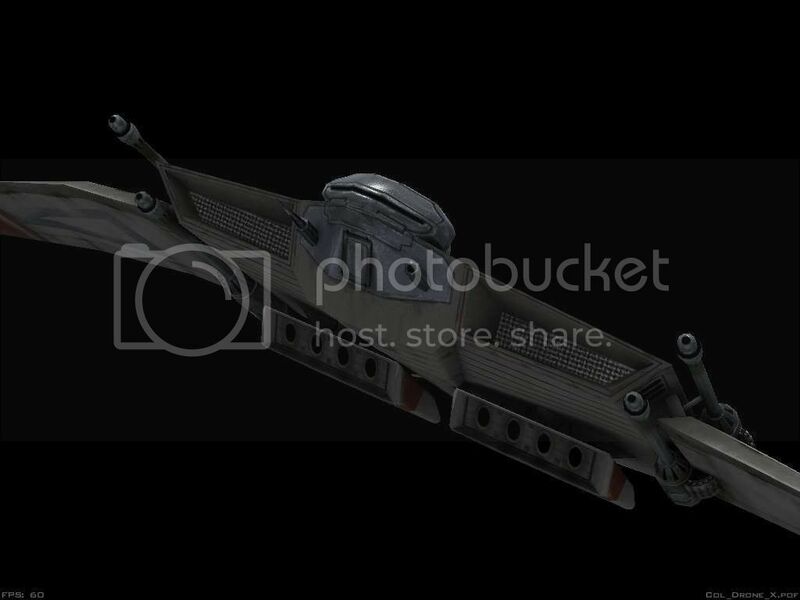 If a red eye is going to be put on it than it could be said that its the same type of eye scanner used on the first centurions. The colonials just modified it to be put on the drones. It's a fair point, actually. On the other hand, the drones they had on Caprica prior to even the development of the first Cylons had the red scanning eye deal going on, so maybe it's just shared technological lineage? Kudos to FUBAR for putting them all on, must have been a hell of a dull job. Let's just say there was a lot of beer and cursing at Newman involved. I'd take it that in the miniseries one of the brick ****ting moments is realizing that the Cylons more or less took the same idea of an unpiloted raider as the Colonials long did with the drones. Well there were Cylon spies. They could have stolen the idea. Now that's an interesting bit, the cylons stole the technology from the colonials. Well if that becomes Diaspora canon I will be upset. 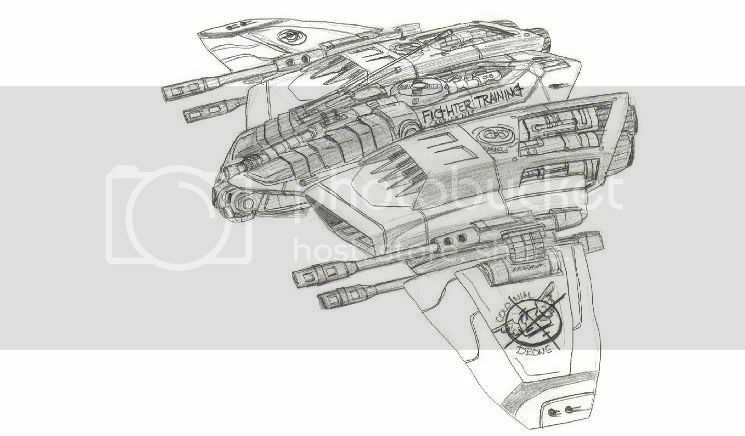 Well the original concept art was an RPA with a big antenna and an Apache style TADS for the remote operator to view from. No need to steal the tech. Simply the idea. The idea of having a drone with the Cylon face on it isn't necessarily a new one either. It could easily be something the military was doing long before the 1st CW. 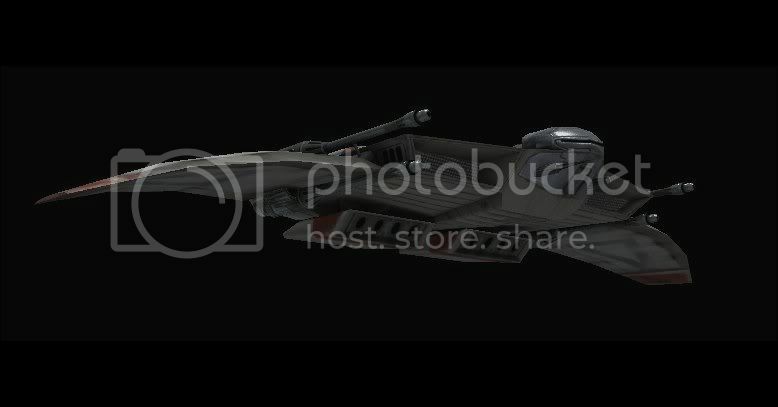 Just because the old Centurion models never wanted to have independently flown ships doesn't mean that the newer skinjob models wouldn't decide to do the same thing the Colonials used to do when they upgraded their Raiders. 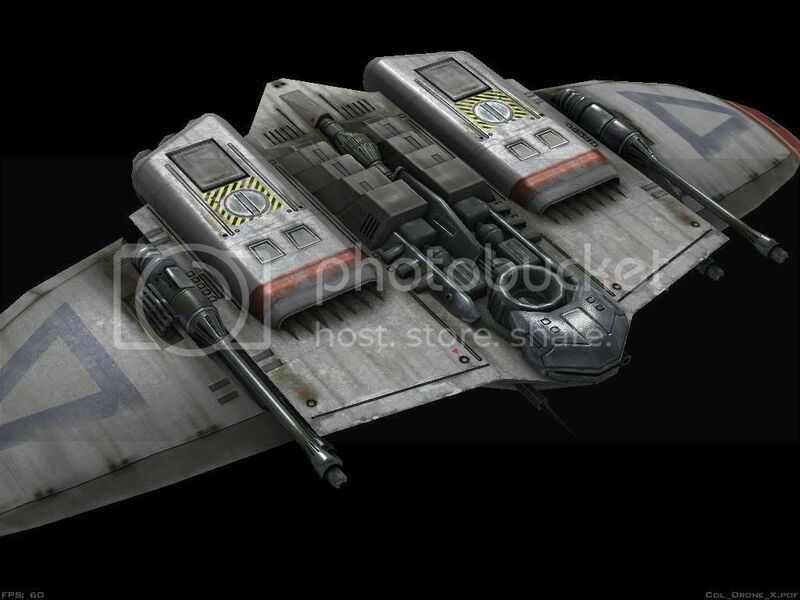 Well the pilots in the mini series seemed shocked that no one was flying the new Raiders so it seems unlikely that they were used in the war. At least not in the later stages. As for the head.. if it's a post-war design drone (and it is), it's purpose is to give pilots a training target that simulates the cylon raiders, both visually and in flying style. 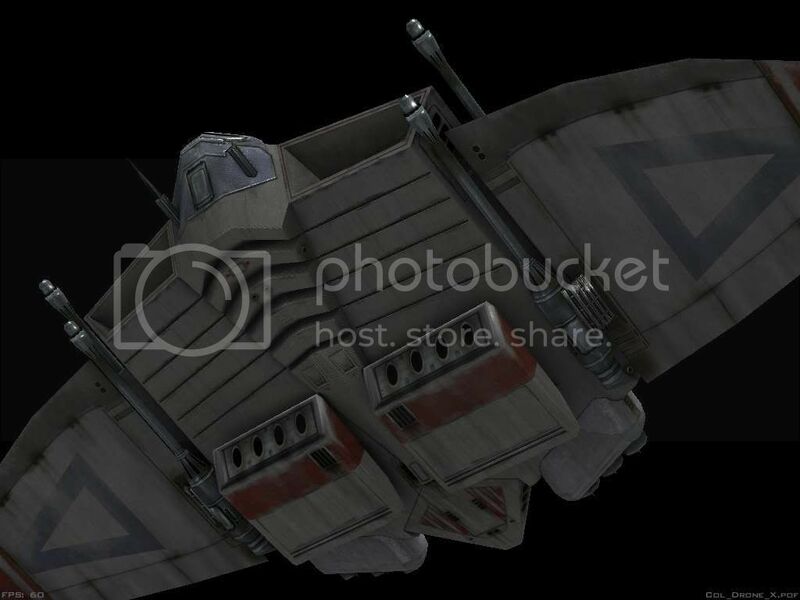 Since the colonials wouldn't be building more centurions to fly it, the lack of a cockpit and a cylon-looking head seem like a logical design decision. The fact the cylons did exactly that with their raiders later on doesn't mean the colonials couldn't have done it for the Drones with some simplified AI - as much as the ban on "real" AI research would allow. Page created in 0.4 seconds with 43 queries.